Hello! We’re a family-run, watch and clock repair shop servicing Auckland and the North Shore. 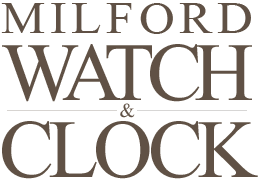 Established in 1982, Milford Watch & Clock Centre has been dedicated to the repair and restoration of clocks and watches for almost 30 years. We repair everything from antique Grandfather clocks and pocket watches to modern quartz movements, as well as carrying an extensive range of new watches and clocks for sale. 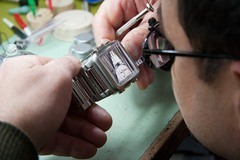 Tim closely inspects a Seiko watch for repair. We repair a huge range of watch and clock brands including: Accurist, Adec, Ansonia, Astina, Bulova, Cartier, Casio, Chopard, Christian Bernard, Citizen, DKNY, Ebel, Fossil, Guess, Hermle, IWC, Junghans, Juba, Lorus, Longines, Montblanc, Movado, Mondaine, Maurice Lacroix, Nixon, Olympic, Omega, Oris, Pulsar, Rolex, Rado, Raymond Weil, Roamer, Royal London, Rotary, Seiko, Skagen, Tag Heuer, Tissot, Timex, Waltham, and Wenger. We replace batteries and watch bands ‘while you wait’. We know how difficult it can be to find the right battery for your particular watch – bring your watch in to us and we'll have it up and running in minutes. We are able to water pressure test your water resistant watch on-site with a same or next day service. Don't take a chance with your favourite watch in water without getting a quick test done first. We carry an enormous range of spare parts and can often source a part for a watch when a customer has been told elsewhere that a part is obsolete and the watch is non-repairable. As well as our ‘much valued’ loyal customers from Milford and the North Shore, we also have customers from all over Auckland and New Zealand. Anyone is welcome to come visit us and we are pleased to provide a no obligation quote on all watch and clock repairs. Feel free to contact us with any questions you may have. We'll be more than happy to speak with you. © 2019 Milford Watch & Clock, Auckland, New Zealand.